Every second, minute and day is a fresh start to your life. 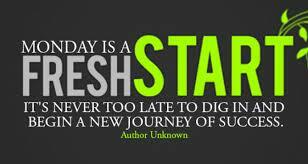 Fresh starts are what’s great about life. Do not let yourself or anyone else hold you back from achieving your daily objectives and goals. It’s time to live for yourself and your Higher Power first and others second. Be proud of who you are and celebrate the positive changes that you create, no matter how big or small, because enough small accomplishments will lead to one or several big accomplishments in your future. Also understand that life is a journey, process and is on a continuum, not a destination. Time does not stop and you will always keep moving, it’s your choice if that movement is two steps up or two steps back. Do you have any small accomplishments or objectives you want to work on today? How will making progress or meeting those accomplishments / objectives improve today? Get Monday Started Off with a Wonderful Playlist. Have a Blessed Monday and Enjoy Today’s Playlist from AddictionPlace.net.